On Monday August 27th, Ad Lib set out to crown Glasgow’s Best Burger. 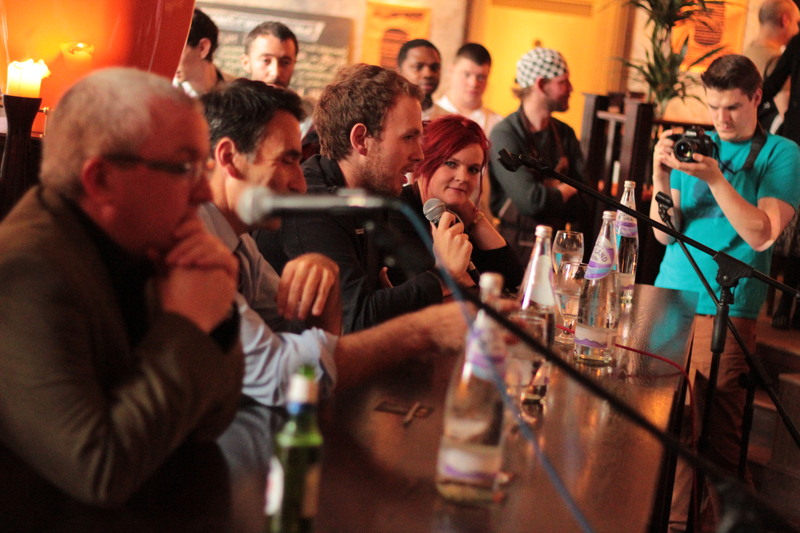 23 chefs from Glasgow’s top restaurants packed into Ad Lib on Ingram street in Merchant City for a cook-off of epic proprtions in an attempt to find the best beef patty the city has to offer. Among those taking part were Tribeca, Chinaski’s, Firebird, The Red Onion, Velvet Elvis, The Ivy, Cottiers, Nice ‘N’ Sleazy and Lebowski’s. 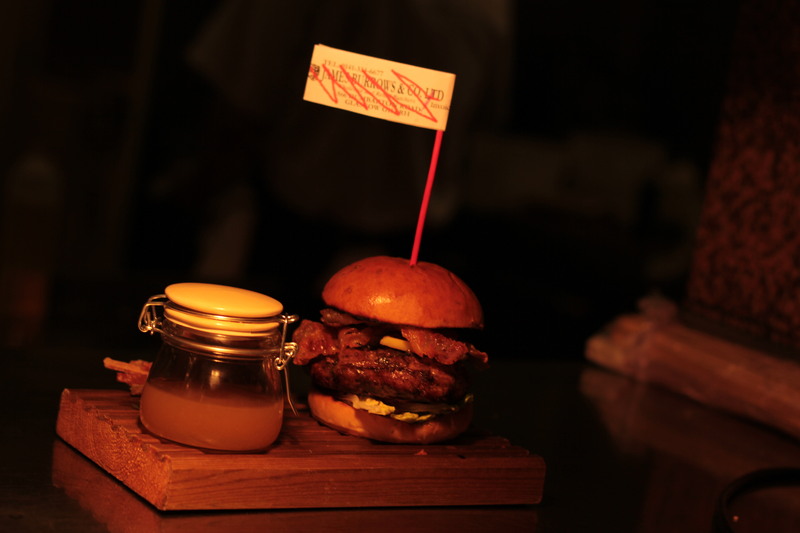 Each chef had ten minutes to prepare two burgers – one for tasting and one for presentation. The burgers were scored based on appearance, eatability (whether the burger was easy to hold and didn’t fall apart), ingredients used, flavour and how it was cooked. Each burger was put to the test by a panel of judges made up of Jennie Cook from Capital FM’s popular Des & Jennie breakfast show, the Herald’s Ron Mackenna, Tam Cowan and yours truly. It was, at times, tough to score burgers against one another as their was so much creativity and such a wide range of flavour combinations being placed infront of the judges. Some highlights included Nice N’ Sleazy’s mouth-watering Jack Daniels soaked burger which was packed with so many different ingredients and flavours that it would be hard to list them all here, Firebird’s wild boar burger, Lebowski’s trademark Big Lebowski burger and The Ivy’s delectable bone marrow burger on a sourdough bun. Not to mention the much-loved Chinaski’s burger and the ‘Bolt Burger’ from Tribeca, which caused fellow judge Jennie Cook to express that it was the biggest plate of food she’d ever seen. After a hard fought battle and many incredible burgers, it was the Grill on the Corner that was crowned the winner for their kobe burger. 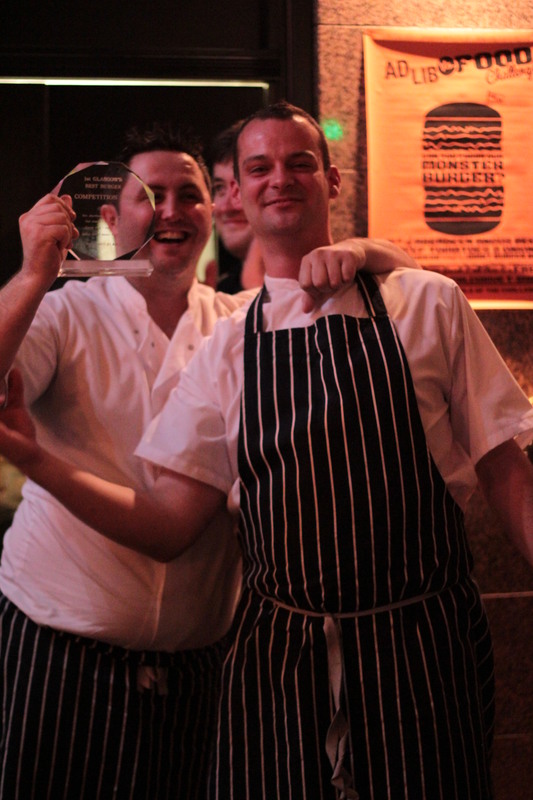 Red Onion came second for their fantastic ‘Thunderstruck’ burger and in third place was Max’s, located on Glasgow’s busy Queen street. 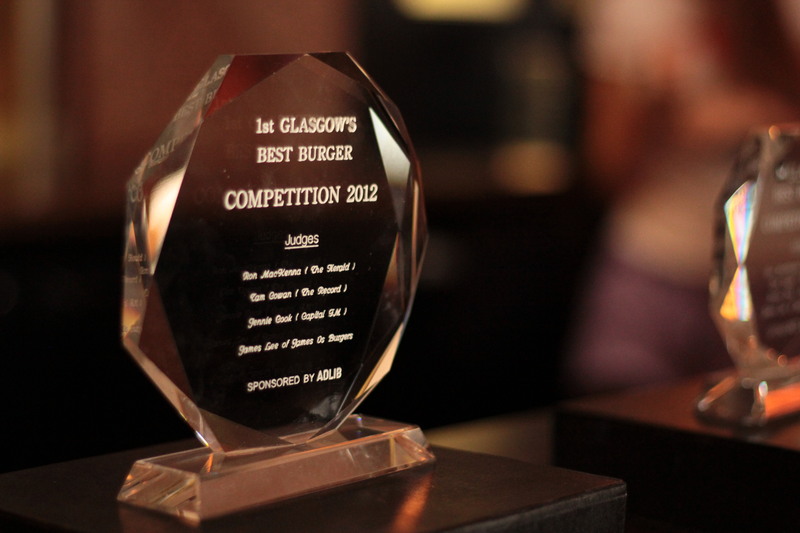 All three winners were awarded trophies and celebrated being crowned the best burgers in Glasgow. For the other chefs involved, there was nothing to be ashamed of – throughout the whole evening, there wasn’t a single bad burger on display and each and every restaurant proved why some of the best burgers in the world are found in Glasgow with strong efforts all around and many chefs already looking forward to next year’s competition. For us, this is the type of event that is needed in Glasgow. When we started James vs. Burger, we set out to highlight great Scottish food and as food fanatics, we knew that Glasgow had some of the best burgers the country had to offer and we wanted to showcase them. This event proved just that. As our readers may be aware, we’ll be running our very own burger awards at the end of the year right here on jamesvsburger.com. We’ll be voting for our own personal favourite and we’ll also open up the polls to our readers so that all of you can decide just which restaurant, bar or cafe produces the best burger in Glasgow. Keep reading and we’ll keep eating! Talk to James on Twitter and tell us what you thought of the event! You can also leave your own reviews and comments below. We want to hear from you! You can also leave a message or join in on the burger chat on our Facebook page.